The perfect finishing touch for your "Resto-Mod". Machined from a solid block of billet aluminum. Features silver button head screws and quality internal components. Security cable included to deter theft. 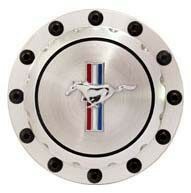 Fits 1965-73 Ford Mustangs.